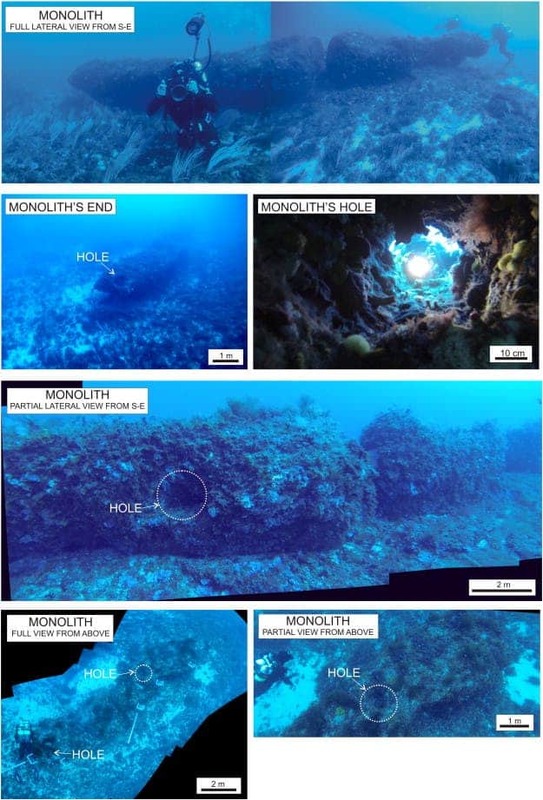 Archaeologists have uncovered an enigmatic monolith deep off the coast of Sicily, Italy. The 15 tonne Stonehenge-like monolith is at least 10,000 year old and may shed new light on ancient Mediterranean civilizations. Archaeologists were stunned to find the huge monolith, but they explain that there’s no way this is a natural phenomenon/process – these are clearly the remains of man-made activity. “There are no reasonable known natural processes that may produce these elements,” Zvi Ben-Avraham, from the Department of Earth Sciences at Tel Aviv University, and Emanuele Lodolo, from the National Institute of Oceanography and Experimental Geophysics in Trieste, Italy, wrote in the Journal of Archaeological Science. Now broken into two parts, the monolith has a regular shape and features three holes going right through the middle. But its sheer size and weight make it impressive – sculpting, moving and installing it was a monumental effort for the time. But how did this remarkable monument get to the bottom of the sea? Well, 10,000 years ago, the coasts of Italy looked significantly different than they do today. The monolith was found in what was once an island in the Sicilian Channel. As the Ice Age reached its end, temperatures rose and so did sea levels. The entire Mediterranean basin changed its appearance. “The Sicilian Channel is one of the shallow shelves of the central Mediterranean region where the consequences of changing sea-level were most dramatic and intense,” the researchers wrote. Slowly but surely, parts of the island were flooded, until the entire island became submerged. It’s not clear if the monolith had any structure or if it was parte of a larger complex. It seems quite likely that even more important discoveries await discovery at the bottom of the sea. “Almost everything that we do know about prehistoric cultures derives from settlements that are now on land. On the contrary, an extensive archaeological record of early settlings lies on the sea-floor of our continental shelves,” Lodolo said. “If we want to trace the origins of civilization in the Mediterranean region, we must focus on the now-submerged shelf areas,” he added.